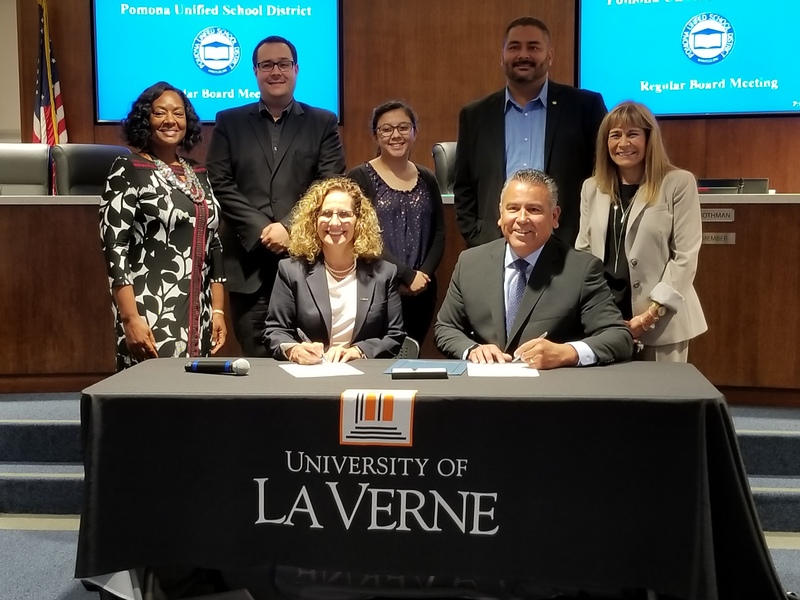 The University of La Verne and Pomona Unified School District have signed an agreement that will allow them to create new partnerships focused on nutrition, physical health, mental well-being, and joint research. University of La Verne President Devorah Lieberman and Pomona Unified Superintendent Richard Martinez inked the document during the board’s meeting on Sept. 12. The partnership springs from the University of La Verne’s planned launch of the Lewis Center for Well-Being and Research, which will begin construction this fall. The center, supported by a gift from developer and philanthropist Randall Lewis, will serve as a unique hub for teaching, researching, and promoting healthy lifestyle habits for students and members of the broader community. Studies have shown that residents of Inland Southern California, which encompasses San Bernardino, Riverside, and eastern Los Angeles counties, struggle with high rates of obesity, diabetes, and mental health issues, among other conditions. The region is also experiencing an acute shortage of primary care physicians. Greater access to community-based prevention and intervention services is critical for the region. The Lewis Center will build and expand these types of services through new curriculum for students, an increased focus on health and wellness research, and via a network of partnerships with community organizations. It is the only center in the region that brings together students’ academic work, faculty field research, recreational exercise, mindfulness activities, community service, and community partnerships in a central location on a university campus. As part of the partnership with Pomona Unified, University of La Verne students and faculty might work with K-12 students to develop initiatives surrounding healthy eating in the community, Lieberman said. The university anticipates announcing additional partners soon.